It's becoming increasing popular to include location shooting information (GPS) in digital image metadata. Being able to insert GPS information with each digital image file ensures that the orignal location can be identified and shared in the future. Since the major camera manufacturers don't include this capability as a "built-in" function on their latest generation of DSLRs, there has been an increasing number of DSLR GPS solutions appearing on the Internet. Many of these products rely on synchronizing the device's internal clock with the camera's timing circuit. These units are NOT attached to the camera and track your physical location while you're shooting by keeping a log in memory. When you return from your day of shooting and download your pictures, the software that comes with the GPS devices then writes the GPS coordinates into each image file based on the time recorded in the metadata of each image. To this aging brain, this process seemed overly complex and easily corrupted if the times were not synchronized or something went wrong with either clock. I couldn't understand why a GPS device couldn't be attached to the camera and the GPS data be written to each image AS it was being shot. This would reduce the complexity to making sure the unit was attached to the camera and turned on. Well, I found one. At least, I found a rugged unit that is designed to work with most Nikon cameras and Fuji's Pro S5. Since I'm a Nikon user for a good part of my work, I was delighted. The unit is offered by Macsense and is called the Geomet'r GPS Receiver. It's about the size of an Apple Shuffle player. Best of all it attaches easily to the DSLR and has only one, non-confusing on-off button. The cost of the unit is $150. I ordered and received the unit within 5 days. Shown above is the simple attachment of the GPS receiver to the accessory socket of a Nikon D200 (red circle). The on-off button is located on the socket connector (yellow circle). The unit also includes a velcorized bracket for placing the unit on the camera's flash shoe. I have gotten into the habit of attaching mine to my camera strap. OPERATING INSTRUCTIONS: Turn on the GPS Receiver. Give the unit about 30 seconds to figure out where in the world it is currently situated. Take pictures. That's it. As each picture is taken, the GPS location coordinate data is included in the metadata automatically. Shown here is the metadata portion of Adobe's Lightroom Library workspace. The GPS and Altitude information were entered into this image file when the picture was taken (red box). The GPS data is now permanently embedded information that will always travel with the digital file. That's right. Google Maps opens in your browser to show you the exact location of the coordinates recorded in the image metadata. Now any picture service that makes use of GPS metadata (like Flickr) will be able to display the location where the picture was taken. Send your best vacation or creative photographs to members of your family, and they will be able to see your pictures and the location. The Geomet'r draws its power directly from your camera's battery. This requires you to charge your batteries more frequently or carry spares. When not in use, TURN THE UNIT OFF or it will continue draining your battery. Like any other GPS unit, the Geomet'r will not work reliably inside a building. In these cases, I take a picture of the outside of the building to have one image from the session with the exact coordinates. I can add this GPS data to the indoor images later in my digital editing program. I have found the Geomet'r to be extremely accurate, reliable and rugged. So, if you have been looking for this capability and own a Nikon or Fuji DSLR, check out the Geomet'r. 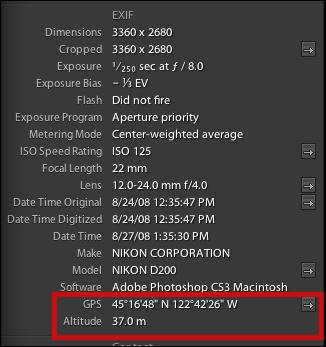 Footnote: As of this post, Nikon has announced an accessory GPS unit similar in size and function to the Geomet'r called the GP-I. However, the pricing information is not readily available. I have seen price estimates ranging from $200 US to $800 US.